At Toyota of Newnan, we take great pride in offering you a wide selection of pre-owned and new Toyota cars at great prices. When you want to be able to experience the brand new 2018 Toyota Camry, you can make your way to your local Newnan, GA Toyota dealership to take one for a test drive. We will be happy to talk with you about all of the options available for this beautiful car, including the powertrain, safety technology and special features. 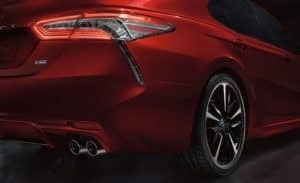 The 2018 Toyota Camry comes with a crisp redesigned shape along with impressive handling and a refined ride. There are also five different trim levels available so that you can pick out the one that suits your driving personality best. In terms of powertrain, the base level is an inline four cylinder 2.5-liter engine that is rated for 206 horsepower while being mated to an eight speed automatic transmission. There is also a V6 3.5-liter engine that is rated for 301 horsepower. In the Hybrid trim level, it features a 2.5-liter engine that is rated for 176 horsepower for improved efficiency behind the wheel. Let us show you all that the 2018 Toyota Camry has to offer at your local Newnan, GA Toyota dealership. For safety technology, standard features include a full complement of airbags, adaptive cruise control, lane departure warnings, forward collision warnings, automatic high beams and active lane control. There is also the option for a surround view camera as well as pedestrian function and rear cross traffic braking and blind-spot monitoring. Special features include dual-zone automatic climate control, power features, Bluetooth® connectivity, 4.2-inch display, and Entune® connectivity system. Options include power adjustable front seats, materials upgrades, navigation, infotainment upgrades and optimization options. If you would like to take a new 2018 Toyota Camry out for a test drive, we invite you to stop by Toyota of Newnan to talk with one of our professional sales associates. You will find our full service Toyota dealership conveniently located on 2 Herring Road in Newnan, GA where we carry a wide selection of new Toyota cars for you to peruse. If you have questions on pricing, selection or financing, please give our sales department a call today at (770) 502-1333 and we will be happy to help!